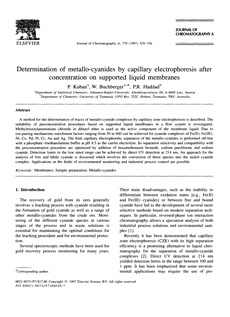 A method for the determination of traces of metallo-cyanide complexes by capillary zone electrophoresis is described. The suitability of preconcentration procedures based on supported liquid membranes in a flow system is investigated. Methyltrioctylammonium chloride in dibutyl ether is used as the active component of the membrane liquid. Due to ion-pairing mechanisms enrichment factors ranging from 50 to 600 can be achieved for cyanide complexes of Fe(II), Fe(III), Ni, Co, Pd, Pt, Cr, Au and Ag. The final capillary electrophoretic separation of the metallo-cyanides is performed off-line with a phosphate-triethanolamine buffer at pH 8.5 as the carrier electrolyte. Its separation selectivity and compatibility with the preconcentration procedure are optimized by addition of hexamethonium bromide, sodium perchlorate and sodium cyanide. Detection limits in the low nmol range can be achieved by direct UV detection at 214 nm. An approach for the analysis of free and labile cyanide is discussed which involves the conversion of these species into the nickel cyanide complex. Applications in the fields of environmental monitoring and industrial process control are possible.